Anna Fink, a student at the University of Georgia, is our next featured blogger from GO Rome! Read below to hear about Anna’s journey outside of her comfort zone and to a place of positivity in the face of challenge. The ferry continued to bob up and down, crashing onto the waves as I tried to find something to focus my eyes on. Unsuccessful, I took a deep breath and counted down the minutes until the ferry reached the coast of Capri. Upon arriving to Capri after what seemed to be a 3-hour ride from Amalfi, I was ecstatic to be on land. Off to a rocky start, I thought to myself, “I am in Capri, Italy. Who cares what the weather is like?” That positive attitude lasted a hot minute when the thunder struck and the rain started to pour. Up to this point, my trip abroad had been about jumping out of my comfort zone and finding my piece of home in a foreign place—immersing myself in the diversity and culture of Italy. Although I thought I had been doing a fair job, 5 hours later, when I finally reached the top, I realized I was so clearly wrong. With a rain jacket hood covering my head and my soaking wet Birkenstock’s dyeing my feet orange, my energetic mood started to dwindle. Thoughts ran across my head. “I paid that amount of money for this?” “A hot, sweaty bus ride and a nauseating ferry trip have come to this moment?” I recalled that my goal for this trip abroad was to see the positive in all situations, something I have always struggled with. What is so wrong with seeing the glass half empty, right? Well no, wrong. Having a tough attitude and hard work ethic but not a positive attitude will not get you to the top, no matter how much you convince yourself that it will. This idea hit me 3 hours later, when I was indeed standing at the top. After an overpriced but yummy cappuccino and a nice walk around the Capri shops with a few of my friends, I was starting to see the pretty parts of Capri. 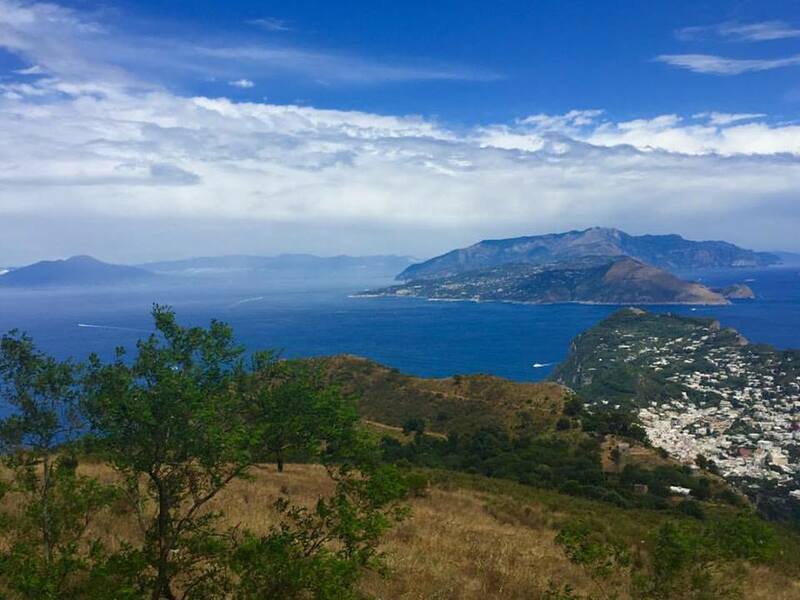 Picturing it without gray skies and wet buildings, I was excited to hike to the uppermost town of Anacapri. With a nice leg workout ahead, the trek began. Still overcast and drizzling, I remembered my goal of positivity and getting to the top. I shook off my own thoughts and focused on the view I was about to experience. With the unexpected help of a bus due to the weather, my travel group finally reached Anacapri. After the tastiest ham and mozzarella panini I have ever had and a few hours of a chilly, damp walk, I could not believe my eyes. I hit my friend and said, “Look! It’s the sun!” The minute we felt the temperature warm our numb hands and toes, we knew we had to do it. We had to go on the chair lift to the top of Anacapri’s Mount Solaro. Eyeing it all day, we were some of the first in line. Little did I know that I would be changed in the most humbling of ways the minute I reached the top. I experienced an array of emotions as I slowly rose over the island of Capri—nervousness that the little bar in front of me was not very sturdy, appreciation that I was able to sit here at all, and astounding joy at the beauty of the little, colorful homes lining the crisp blue Mediterranean water. Boy was I in for a surprise when the lift dropped me off at the peak of the mountain. It is an indescribable feeling to look down upon the vast ocean, calm and still. Feeling as if someone knocked the wind out of me, the only thing I could do was cry—cry at the overwhelming captivation of the mile long cliffs below me, colorful flowers around me, and vanishing mountains in the distance. I felt as if I was standing above the clouds, thinking to myself that this is what Heaven must be like. Nothing can prepare a sheltered American young woman for the breathtaking beauty of the world. As I took in the view and tried to hold back further tears, I thought about my goal. It seemed tangible now as I stood over an entire island with the warm rays of the sun on my face. This was it; this was the astonishing moment when I realized that positivity prevails. So focused on my future weeks abroad and even my future years ahead, I had not been appreciating the sheer beauty that life offers. No amount of rain, seasickness, or curvy cliff roads can stop you from getting to the point you want to be. No amount of obstacles can prevent you from appreciating the journey and finally reaching the top.